Summer is the best time of the year, but sometimes the heat gets in the way of the activities we’d like to do. Swimming pools are a great way to combat the heat and have fun doing it! Not only are they wonderful for passing time (and getting exercise) but they can also turn your otherwise barren backyard into a busy, decorated outdoor space. In this article, we’ve put together 21 of our favorite swimming pool ideas to upgrade your yard and give your family something to do during the long summers! These pools are often seen at hotels. 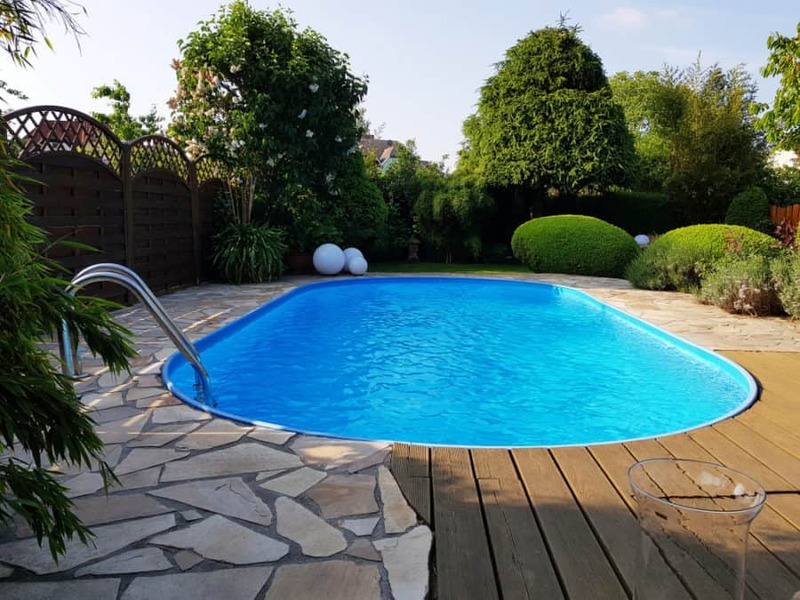 With their blue tiles and symmetrical design, this rectangular pool is ideal for those who prefer a more simple appearance, or those who’d like to put the focus on other outdoor design elements rather than the pool itself. Another simple design, oval-shaped swimming pools are meant to have muted features as to not take away from the surroundings. Contrary to rectangular pools, oval pools have a more smooth appearance without the harsh corners. 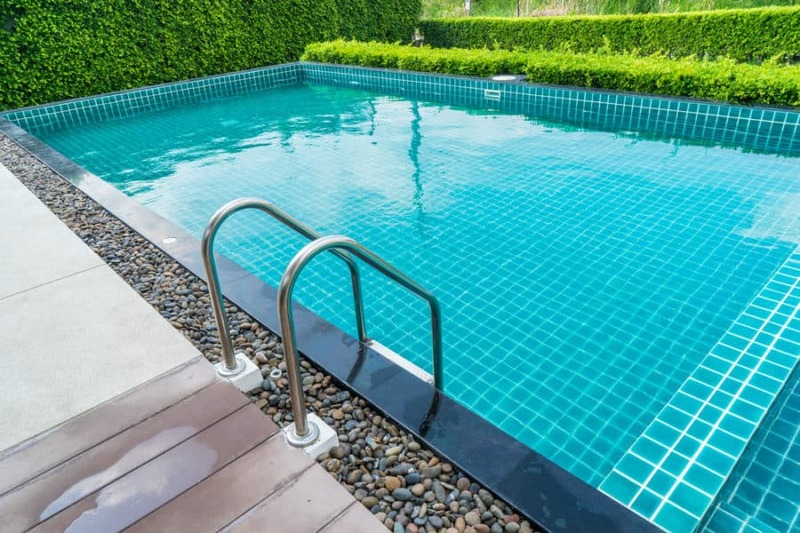 Above-ground pools are generally not as large as in-ground pools, which makes them great for those who have less space available in their backyards. 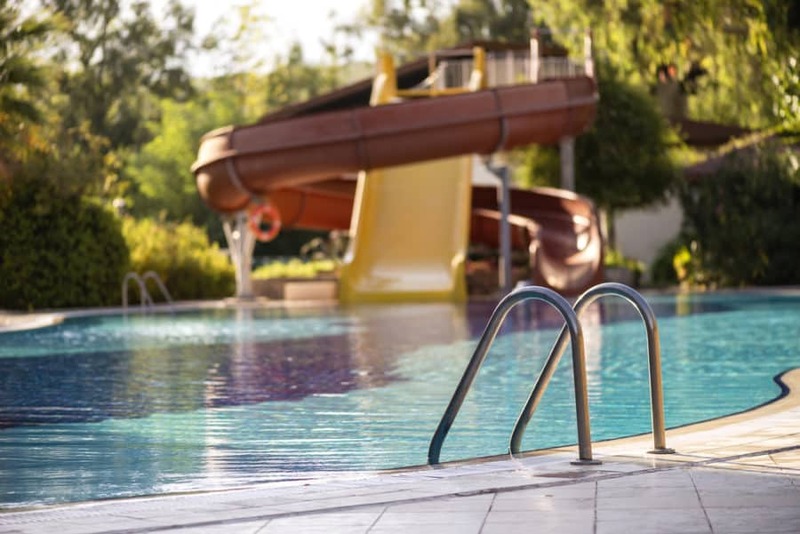 Not only are they more convenient for a variety of families, but they also are easier to maintain, as it’s more difficult for natural debris to get into the pool (and they’re easier to cover than full-size pools). Best placed in an area that overlooks a spectacular view, infinity pools are designed to blend in with the natural surroundings as if water were pouring over the edge of the landscape. They’re often made of clear materials to give the illusion of free-falling water. 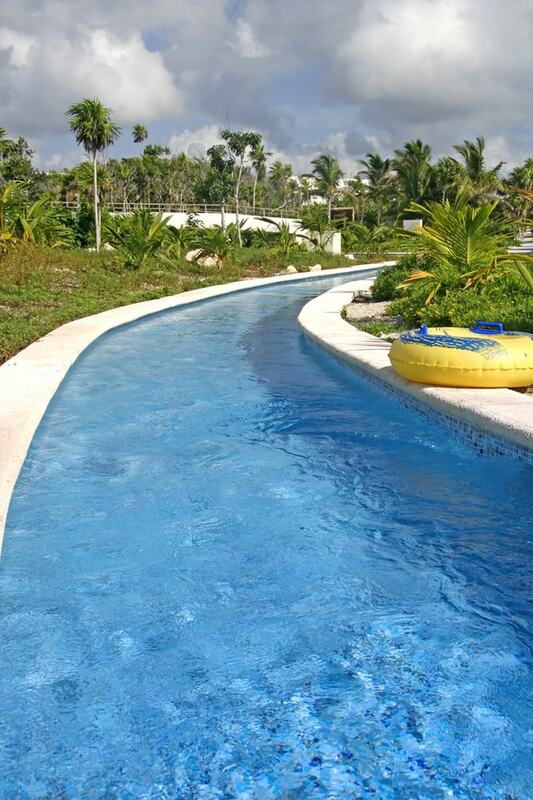 If you’re one to enjoy lounging around and going with the flow, a lazy river may be a great addition to your backyard. Though they’re usually seen on giant scales, such as at hotel resorts, lazy rivers can be customized and scaled to private homes, as well. Lap pools are generally quite long and skinny rectangular pools used primarily for exercise purposes. These narrow pools are great if you don’t have much extra space in your backyard for a full-sized pool. If you have small children and aren’t committed to installing an above or in-ground pool in your yard, a kiddie pool may be the best option for you. They’re often budget-friendly and easily stored (or disposable) for when your kids get bored and want to do something else. If the scent of chlorine is bothersome to you, saltwater pools are a great scent-free, bacteria-killing alternative. Not only will the scent of chlorine be absent from your pool, but the saltwater pool system creates its own chlorine, which saves you trips from having to go buy more chlorine to add to your pool. For those who enjoy the sound and appearance of falling water, adding a pool with a stone waterfall would be the perfect addition. The large waterfall in the photo above is eye-catching with its massive size and beautiful stone build. When a large waterfall is out of the budget (or not your style) this modestly-sized contemporary glass panel waterfall is a great second. 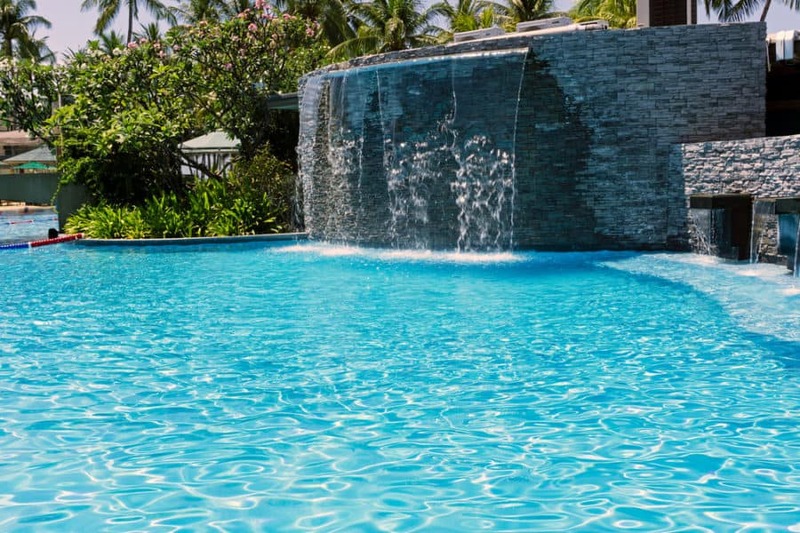 Not only does this glass waterfall give you the luxury of a pool waterfall at a decent price, but it also gives the appearance of floating water which is incredibly intriguing. For those who like to relax in a cool pool during the hot summer days and rest your muscles in a warm hot tub after a workout, this swimming pool and hot tub combination would be an excellent backyard feature. Similar to in the photo, the water from hot tubs generally spill over into the pools when the water level gets too high (and it looks pretty cool, too). If you really want to make a splash into your pool, a slide is the best way to go about doing that. Installing a slide on the side of a pool is by far the most fun way to turn your backyard into a home waterpark. It appears this circular pool is an above-ground pool installed in-ground. This is a unique way to save money while at the same time keeping your backyard looking tidy without the stuck-out appearance of a pool sitting above the ground. The distinct separation between two areas of this L-shaped pool makes this style suitable for those who want to draw a noticeable separation between deeper and more shallow ends of the pool. As you can see in the photo, the closer part of the pool has steps while the further part of the pool is clearly deeper. Imitating the often mirrored detail of Roman art, Roman-styled pools are known for giving backyards a more wealthy, sophisticated appearance. Freeform pools are designed specifically to tailor to every landscape. They’re usually built around or through already existing landscapes or objects and are often surrounded by plant life. This type of pool would be great for those who have immoveable structures in their backyard that can be built around. For those who adore luxury, this lounge area extending inside the pool is probably the most relaxing pool space we’ve come across. What’s better than taking a nap or getting a tan next to a pool? We all know how nice it can be to have a cool drink on a hot summer day. This awesome tropical bar on the edge of this pool (with bar stools in the water) would be a great place to float up to when you need a little pampering. If you enjoy the idea of wading in your pool in complete privacy, this enclosed pool area may be what you’ve been dreaming for. 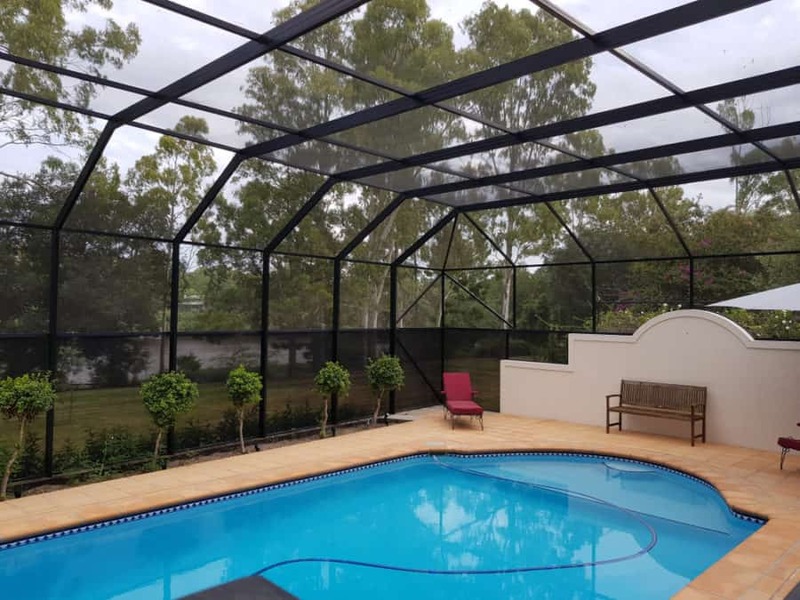 Not only does this enclosed pool increase your privacy, but it also protects children and pets from entering the area on their own unsupervised. This garden island in the center of the pool gives off a very tropical vibe. If you’re looking to bring the beach home, this lively addition to a pool would be a wonderful choice. Swimming pools with high dives are perfect for those who are looking to make swimming their sport (or for those who think jumping from high places into water is a fun thing to do). Just be sure that you have a really deep pool before you install a high dive. Swimming pools are a great way to liven up your summers and add detail to your backyard. Though they can cost a pretty penny, they’re sure to give you years of well-needed relaxation, fun, and exercise (but you don’t have to think of it that way). We hope you enjoyed this list of our favorite 21 swimming pool ideas! Happy swimming! Need more ideas for your pool? Check out our Pool Landscaping Ideas, and Best Pool Basketball Hoops articles!